The race was a mix of Ford Focus and Nissan Silvia S15. Focus drivers may have a little advantage in this race but it's manageable, of course. I've taken the lead 30 seconds into the race so I'm quite sure now my setup is still good. When the first lap was finished and no one has overtaken me yet, I'm sure I'm gonna win the race and I did. My opponent was pretty slow so I've overtaken him around 20 seconds into the race. The game, however, hung up after the race and I had no other option but to force close it. I don't know what the problem was but I was surprised having to experience this slight issue knowing I'm rolling an octa-core smartphone with very few apps installed. I will closely monitor the performance of the game and probably send a report to developers in case I encountered problems. As long as you get the timing, this race is a walk in the park, and that's what happened. I hit the launch button when the lights turned green, all my shifts were perfect and I got the trophy. Still enjoying the game but it's a drag if I have to blog once a day about these beginner series. 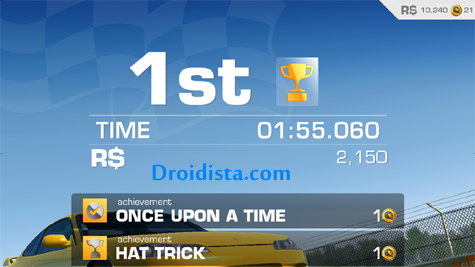 I'm thinking I would spend a day of gaming Real Racing 3 tomorrow and see how far I can go. I will finish Pure Stock Challenge and would blog about it, then I will proceed with Street-spec Skirmish.